The subject of children and their eating habits is a touchy one. Each of us seem to have our own opinions on how best to provide a robust food education to our children. What we can agree on is that our early year experiences sets us on the course of who we end up as later in life, so modelling a healthy relationship with food from the beginning is something that shouldn't be taken too lightly. Eating is a shared, communal experience. We eat together, as a family. Eating happens at the table, not in a car, stroller, or while running around. The only company we keep is each other; no toys, TV, or phones during mealtime. Everyone eats the same food, and only what's offered at that meal. 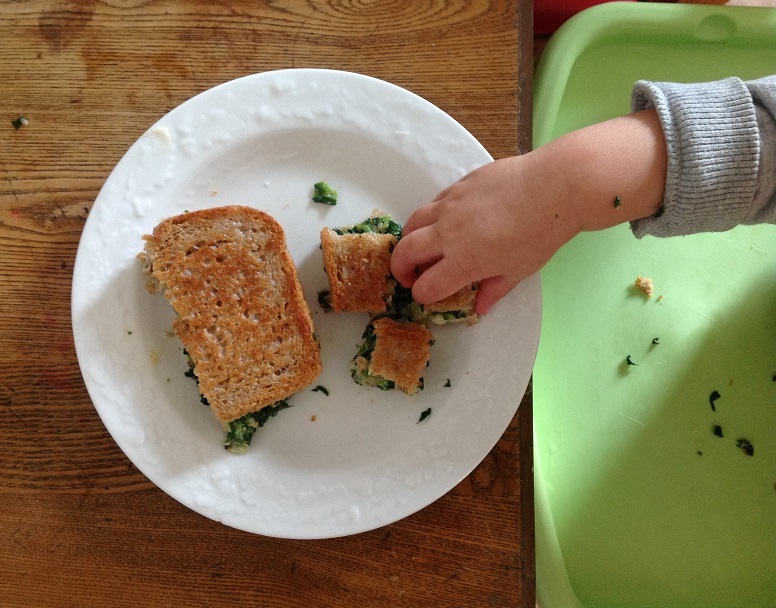 Snacking is reserved for social events, and only when other children are also snacking (e.g. birthday parties, play dates). The kids get 2-3 snacks a day at daycare. But when they are with us, we don't provide any snacks, as it often ruins mealtime appetites. If the kids are truly hungry between meals, they can have a glass of milk, and a reminder to eat when food is available, which is only at mealtimes. Food is never to be used as a reward or punishment. Nobody is coerced into eating anything, but everyone is encouraged to try new foods or things they claim not to like. Food should be treated with respect. No playing with food. No throwing food. No "hiding" vegetables in sauces or smoothies. All foods should be appreciated for what they are, and if the child isn't interested in trying it, we'll just offer it again another time. Our kids are still kids. They would rather have cookies over a bowl of soup any day. Sometimes they only get in a couple of bites before wanting to run off and play. Other times there are tears because vegetables are mixed right into the pasta, or the food is too hot. But they also love picking clams our of their shells, munching on leafy greens right off the plant, and going to town on a bone-in chicken leg. The girls act silly and there are lots of giggles, and we chat about our how our day went and upcoming weekend plans. And when mealtime is over and the clean-up is done, there's always another meal to look forward to only a few hours away. These little sandwiches are quick to make, especially if you prepare the filling in advance and keep it in the fridge until you're ready to assemble your sandwiches. Blanch spinach by immersing in boiling water for 30 seconds. Drain and rinse with cold water to stop the cooking process. Squeeze the spinach with your hands to remove as much water as you can, and roughly chop into small pieces. Heat the olive oil on a skillet on medium heat. Add onion and garlic, and cook until the onion softens, about 2-3 minutes. Add cream cheese, and mix until the cream cheese melts and there are no large lumps. Stir in spinach, nutmeg, salt, and pepper, and scoop into a bowl. Clean out the skillet in preparation for sandwich grilling. Assembling the sandwiches: lay down a slice of bread. 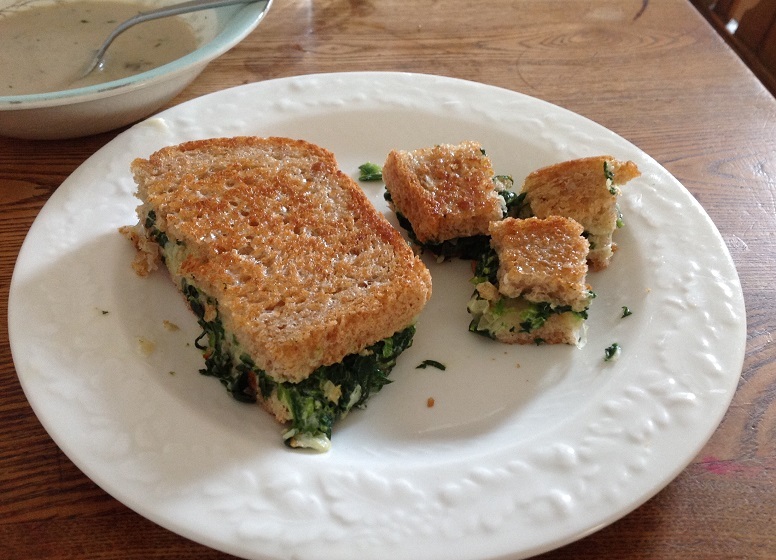 Spread a thick layer of spinach-cream cheese, and cover with a slice of swiss cheese. Sandwich with another slice of bread. Repeat with the remaining 6 slices of bread, to make 4 sandwiches altogether. Cooking the sandwich: heat the skillet on medium heat. While it is heating up, spread butter or mayonnaise (my preference) on both sides of the sandwich. Place on the skillet and heat until golden brown and crisp, about 2 minutes. Carefully flip the sandwich, and brown the other side the same way. Remove from heat, and repeat with the remaining sandwiches. Slice into quarters, and serve warm. Mmmm, sounds like a great recipe! Thanks, I've been meaning to write about this subject for a while, but wasn't sure how to broach it. I'm quite sure that most parents out there feed their children different food than what they eat. I always found it to be much easier just to cook one meal for everyone. It took me awhile to comment but I finally got around to it. ;) I can't even imagine what it's like to try and get kids to eat. I like your first rule about eating together. It's definitely a lost "art". Most families are glued to a tv or to their phones. Your kids are lucky cause I'm sure your meals are DELISH!